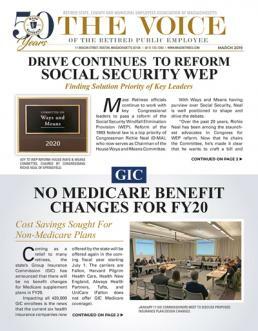 If legislative action this fall is any indication, 2018 may finally be the year when Mass Retirees gains a seat on the state’s Group Insurance Commission (GIC). For the second time in six months, the Massachusetts State Senate has approved a proposal that would grant Mass Retirees direct representation on the GIC. The Mass. Organization of State Scientists and Engineers (MOSES) and S.E.I.U. Local 509 also gain seats on the Commission under the proposal. Both seats are created by transforming two of the current “public seats” held by the governor. The proposal was filed by our Association as an amendment to S2202, An Act furthering health empowerment and affordability, which aims to gain control over rising healthcare costs. Joining Mass Retirees in backing the amendment was each of the state’s public employee unions and the Mass. AFL-CIO. Senators Michael Brady (D-Brockton) and Cindy Friedman (D-Arlington) took the lead as the main sponsors of Amendment #87. They were joined by nine Senate colleagues as cosponsors: Feeney, Cyr, McGee, Boncore, Timilty, Gobi, Eldridge, O’Connor and Montigny. Accepted on the 2nd day of debate on S2202, legislation that marks the state’s latest attempt to address health care costs, the amendment maintains the current number of GIC Commissioners at seventeen. However, the proposal restructures the GIC makeup by granting Mass Retirees nominating authority for the retiree representative, as well as by transforming two of the governor’s appointees to “labor seats”. While the law currently calls for one of the GIC’s 17-seats to be held by a state retiree, the statute grants the governor complete control over whom that representative will be. As it now stands, former State Representative Anne Paulsen (D-Belmont) is the retiree representative. She was appointed and twice reappointed by former Governor Deval Patrick. Paulsen’s term expired this fall, but continues to serve pending either a reappointment or replacement by Governor Charlie Baker. Mass Retirees has called on Governor Baker to reappoint Paulsen, citing her ongoing contributions to the Commission and her experience. The debate will now move to the House of Representatives, where legislation is expected to appear early in 2018.